Myths and misunderstandings abound no matter what skill we’re trying to learn. An important part of learning is sorting out the misinformation surrounding a topic. So today I want to talk about what deep point of view isn’t. Misconception #1 – You need to write in first person to write deep POV. Deep POV isn’t about pronouns. We can write deep POV from a third-person point of view. And we haven’t necessarily created a more intimate story by writing in first person rather than third person. First-person point of view can feel cold and distant too. Misconception #2 – You create deep POV by spending a lot of time on internal dialogue. This is possibly one of the most dangerous misconceptions about writing in deep POV because it can lead us to include too much internal dialogue (character thoughts) within our stories. Books written in deep POV usually will include more internal dialogue than a book written in a more distant POV, but that internal dialogue still needs to be seamlessly woven in with action, description, and dialogue. We shouldn’t allow our stories to stall out by dropping in giant chunks of internal dialogue. This isn’t the only issue with this misconception, though. Deep POV is about more than simply internal dialogue. It’s also about internal, visceral reactions to what our viewpoint character experiences. It’s about creating a feeling of immediacy, as if we’re watching the story play out in front of us as it happens (regardless of the tense used). It’s about allowing the viewpoint character’s judgments and opinions and biases to color everything on the page. Misconception #3 – Deep POV requires us to put our internal dialogue in italics. Point of view can be a confusing topic for writers because of how closely it ties to showing vs. telling and internal dialogue. Whether or not to italicize internal dialogue is a question of formatting and not one of whether you’re writing in a deep or shallow point of view. The guidelines for italicizing our internal dialogue are outside the scope of this book, but generally speaking, we’ll have less italicized internal dialogue in a book written in deep POV than we will in a book written in a shallower POV. This is because we only italicize internal dialogue when it’s what’s called direct internal dialogue. Direct internal dialogue is written in first-person present tense regardless of the tense and person of the rest of the story. Because it’s italicized, it draws attention to itself. In deep POV, we’re so close inside the character that the character’s thoughts tend to flow and interweave with the rest of the writing and are best written in the same person and tense as the story itself. To explain this another way, the less the internal dialogue draws attention to itself, the more immersed the reader feels in the character. The less attention the internal dialogue draws to itself, the closer the reader feels. Misconception #4 – Deep POV means we have to show everything that happens. One argument I’ve heard against deep POV is that it will make your story too long and feel too slow because you need to show everything that happens and you can’t summarize. They gathered up their belongings. They ran two red lights on the drive to Brenda’s house. 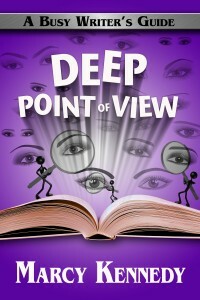 According to this misconception of deep POV, you wouldn’t be able to write either of those sentences in a deep POV book. You’d need to show them collecting every single item or you’d have to show the entire drive. Deep POV doesn’t mean you show everything that happens in a stream of consciousness-style narrative. Deep POV is an overarching technique we can use in our writing, but we can still pull back and use moments of narrative summary to skim unimportant information when necessary. We can also cut any internal dialogue that would bore the reader. Deep POV is a tool, not a straightjacket. Deep Point of View: A Busy Writer’s Guide is now available! Do you want readers to be so caught up in your book that they forget they’re reading? Then you need deep POV. Deep POV takes the reader and places them inside of our characters—hearing their thoughts, feeling their emotions, and living the story through them. Compared to other writing styles, it builds a stronger emotional connection between the reader and our characters, creates the feeling of a faster pace, and helps avoid point-of-view errors and telling rather than showing. In Deep Point of View, you’ll learn specific, practical things you can do immediately to take your fiction to the next level. Each book in the Busy Writer’s Guide series is intended to give you enough theory so that you can understand why things work and why they don’t, but also enough examples to see how that theory looks in practice. In addition, they provide tips and exercises to help you take it to the pages of your own story, with an editor’s-eye view. Most importantly, they cut the fluff so that you have more time to write and to live your life. Grab a copy from Amazon , Barnes and Noble, Apple, Kobo, or Smashwords.